There are so many basket-handle arch bridges on the Wangan Expressway that it's hard to tell them apart. 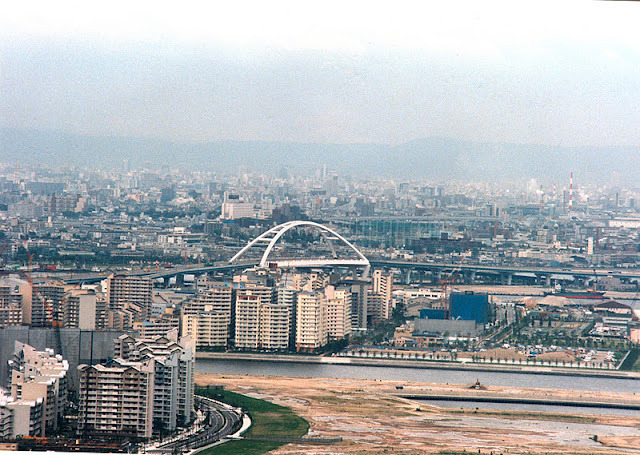 I can recognize the bridge in today's photo as the Nishinomiya-Ko Bridge because of its distinctive W-shaped piers. This bridge is famous, among other reasons, because the east approach span came off of its support (on the arch side) and fell to the ground during the 1995 Kobe earthquake. This was surprising because the seat was about one meter long and the approach span was attached to the arch bridge with steel plates. Although some engineers assumed the damage was due to liquefaction of the surrounding soil, the bridge was well-supported on deep caissons and a better explanation was that out-of-phase motion between the long-period arch bridge and the shorter period approach spans caused enough displacement to drop the span. I took this photo in 1998 while standing on a tower of the Higashi-Kobe Bridge. I was in Kobe to study bridge repairs after the earthquake. My family and I spent a month in a little hotel by the Shin Kobe station. Every morning, while I rode an old bike to the Hanshin Expressway Corporation downtown, my family would take the Shinkansen (bullet train) to some exotic destination. Osaka Bay Bridges: Nishinomiya-Ko Bridge by Mark Yashinsky is licensed under a Creative Commons Attribution-NonCommercial-ShareAlike 3.0 United States License.